When Ryan Reynold’s other half gave us a peek inside her spacious walk-in, we couldn’t decide what we loved more – the shoes or the space. From what seems to be a floor-to-ceiling shelving unit solely built for shoes, it’s hard not to compare it to the tiny spaces we love. Here, we rounded up ten rather cozy spots that are (probably) smaller than Blake Lively’s shoe closet Take a look. 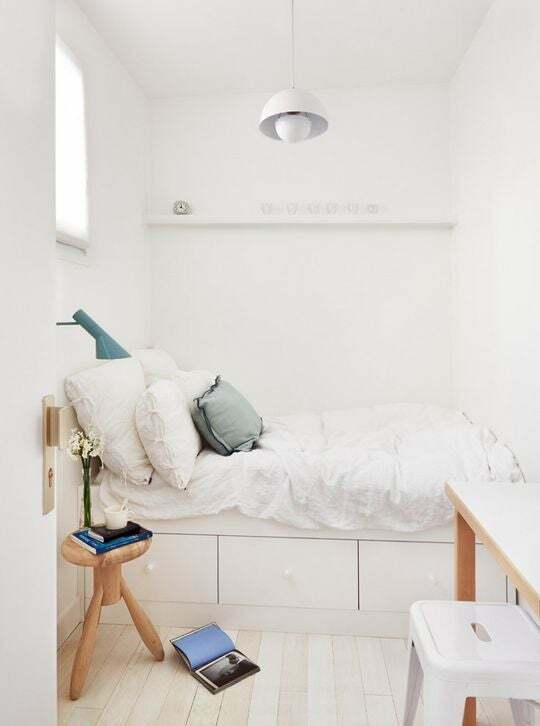 We wouldn’t mind a tiny bedroom if it meant having an exposed brick wall as chic as this. A simple spot void of the superfluous packs in plenty of style and color. A clever storage bed makes great use of an intimate space, coupled with a stool that doubles as a nightstand. A whimsical wallpaper distracts the eye from a lack of square footage. With a view and window as captivating as this, who needs a headboard? This is one spot we wouldn’t mind waking up in. A cleverly lofted setup is paired with an industrialized steel ladder and an intricate floor tile in this ultra modern setup. Mirrored panels aside the whitewashed brick wall (that doubles as a headboard!) evoke an illusion of a larger space. When your bed spans the entire width of your bedroom, a little creativity is in order. For the all-white space, a two-toned stool and a potted plant effortlessly complement the bold, gray bedding. A tiny spot with multiple elements of functionality that don’t compromise on style. Bonus points for the clever placement of the laundry room!